Walking into the new boss’s office the first few times to find AC/DC, Nirvana, and Rolling Stones DVDs playing on the same big screen the previous chief had used solely to watch news updates boded well. I submitted my heavy metal fandom as an ingratiation offering right away and imagined myself eventually becoming his personal rock consigliore. To my dismay however, I soon discovered that his openness to counsel was not exclusive. He proved willing to take his musical broadening from any peddler with a CD burner. I knew the cause was finally lost when, just two days after having gifted him an expertly handcrafted Melodic/Goth Metal mix to little response, I found him effusively praising a compilation of manic California skatepunk passed him by some other wannabe Rasputin. Recognizing my pearls had been cast before swine, I let go the pipe dream of taking on an elder apprentice and retreated back into the closet solitude of unrecognized genius. 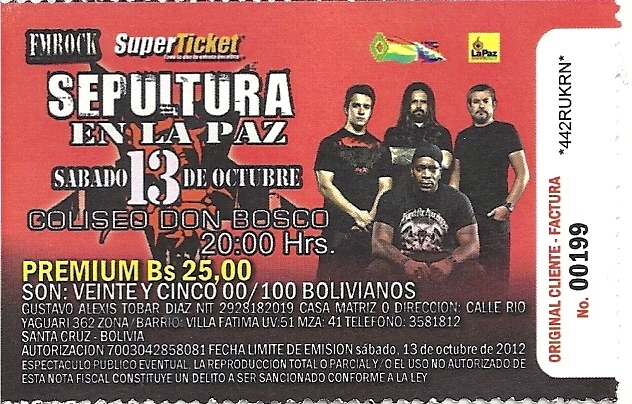 Some months later when posters started appearing around La Paz for an upcoming show by Brazilian extreme metal band Sepultura, I took what I viewed as an opportunity to remind the boss of the wisdom he had forsaken by first subtly calling out his lack of awareness of the show, and then suggesting we attend together. Despite never having heard of Sepultura, he signed on immediately with no effort to obtain further detail or description, thus reinforcing his infuriating “open to anything from anybody” nature. To make matters worse, he nonchalantly noted that his spouse would attend also, leaving me no option but to announce that both my spouse and my 17-year-old daughter would be accompanying me. Because, you know… if I were unable to demonstrate sway over even my own dependents, how would I justify my (self-proclaimed) mandate to guide the tastes of strangers? Now, the truth is that I am not a Sepultura fan. While their musicianship and ability to mix the occasional traditional Brazilian rhythm into their earsplitting riffage earns my praise, I am put off strongly by their growling/grunting death metal vocal style. I tried to force myself to focus beyond the vocals in the weeks leading up to the concert but was unsuccessful. As a result, I grew nervous as the show date neared. Would I end up inadvertently confirming the boss’s lack of awe at my musical insight by dragging him to a repulsive aural barrage that even I could not defensibly endorse? Twice I entered his office to warn of Sepultura’s challenging extremism, hoping to both offer him an opportunity to bow out and to lay down a marker should there be any after-the-fact questioning of my judgment. He was unfazed. “Sounds like fun” was the extent of his reaction. 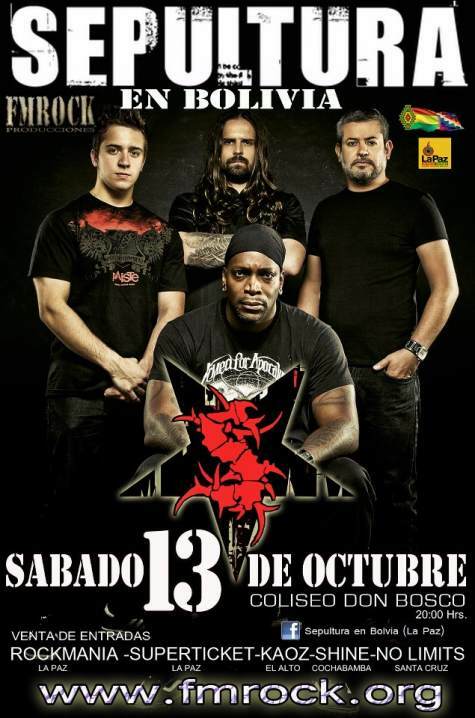 The days passed, the calendar turned, and soon Sepultura was upon us. Going to a heavy metal concert in a foreign land in the company of a senior diplomat was different from my usual experience. The two extra tickets for the Bolivian National Police bodyguards who accompanied us inside the concert venue were covered by the U.S. taxpayer, as was the cost of the vehicle and driver that gathered us at our homes and delivered us directly to the main gate. The bodyguards’ badges ensured we were first into the hall, stepping onto the general admission floor nearly 30 minutes before the rest of the crowd. That meant we were standing against the railing immediately in front of the stage when the show began. It wasn’t just a possible touch of temporary sensory unpleasantness for my boss anymore, I now confronted the very real possibility that I would bear responsibility for my own wife’s and daughter’s ruptured ear drums from the auditory onslaught in front and their smashed spines from the crushing crowd behind. As the two local Bolivian opening bands screeched out their not-wholly-disagreeable sets, I braced for what was to come. Sepultura hit the stage like a wrecking ball. From the first thump, the sledgehammer drums threatened to bring the cement ceiling down on top of us. The guitar, bass, and throat-shredding vocals fused into one blunt, reverberating wall of sound that didn’t suggest songs so much as a galloping drone that rode over whatever pounding rhythm the drummer happened to hammer out at any given moment. The crowd in front of the stage where we stood spontaneously erupted into a giant mosh pit of ramming bodies and flailing limbs. I spent the first six or seven songs grasping the railing on either side of my wife and daughter while tensing my body in an attempt to create a protective barrier against the exploding human mass. My muscles burned as I sought to both keep my grip and absorb the clobbering blows of the mosh. From what I could tell, my efforts were successful as my wife and daughter remained focused on the stage, not so much enjoying the music as enthralled by the spectacle. When I did finally remember to look over at the boss and his wife, instead of the grimaces and disgust I expected, I saw only grins and exuberant head-banging. It turned out that the mosh pit ended at my pummeled back, leaving them to comfortably bop in a calm void created by the deft placement of his bodyguards. All were oblivious to my noble self-sacrifice. Midway through Sepultura’s set as my arms throbbed and my neck wrenched, I finally had the sense to grab my wife and daughter and move away from the stage. I was surprised to find that we only had to go about ten feet back and toward the side before coming completely free of the crush. We were able to spend the rest of the show in our own individual space, each one swaying, rocking, or simply staring along to the booming racket to the tune of their personal preference. Whether by plan or as the result of a crappy sound system bouncing its output off untreated concrete walls, the gruff vocals were subsumed into the instruments, allowing me to lose them almost completely in the din. The near-tribal drums pulled me in while the greater noise ensured that all extraneous thought emptied from my liquefying mind. Now finally able to pay attention, I found a comfortable groove. By the time it ended and Sepultura departed the stage leaving us with only the ringing in our ears to remember them by, I could not have told you how many or which songs they had played. My wife and daughter were both smiling as they enthusiastically recapped the crazy scene they had witnessed both on stage and in the audience. The boss and his wife were also exhilarated, specifically citing the “incredible physical presence” of Sepultura’s vocalist as a highlight. Everybody was happy. It was then that the realization hit me. None of my companions were candidate disciples hungering to sit at my feet and partake of my rock and roll insights. They were “experience seekers,” not potential pursuers of my enlightened musical truths. On this night, I had been simply a sponsoring participant vice the architect of their cultural education. I carried neither the burden nor the power to steer their course for them. I found myself concurrently relieved and disillusioned. I was apparently not a sage.